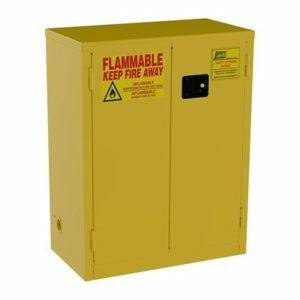 Flammable storage cabinets are required by OSHA and many local safety codes – and are just a good idea. They are designed to meet fire codes and safety regulations to keep fire contained. Safely store flammable liquids in safety cabinets to reduce the risk of a devastating fire in your warehouse or factory workplace. High performance, code compliant steel cabinets accommodate all types of combustibles. Flammable cabinets are designed to meet safety requirements whenever the handling of flammable or combustible liquids is involved. They are also designed for caustic chemical storage. If you are not sure what type of flammable storage cabinet or chemical storage you need, give us a call to discuss the details. We can help with both chemical storage cabinets and flammable storage cabinets. We service mid Ohio and northern Ohio, including Akron, Canton, Cleveland, Youngstown, Columbus, and Toledo. We also work with customers in Pittsburgh, PA.
You can contact us here or give us a call 330-753-7225.